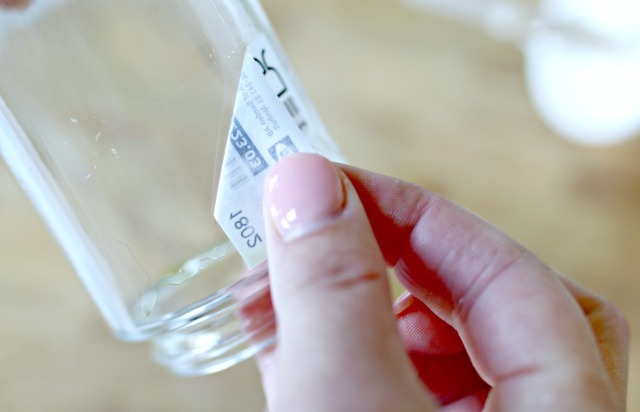 Removing stickers, labels and price tags can be a major pain, but I’ve got a super easy trick that will Remove Stickers in Seconds without scratching your items or tearing the tags! One of my biggest pet peeves is to buy something then have to spend lots of time and energy trying to remove the sticker, price tag or label from my purchase. Sometimes it almost seems like stores and companies don’t want you to remove the stickers…they can really be a pain. Years ago, I discovered that all you need is one little thing to remove those stickers and price tags in seconds, and I haven’t wasted time on them since. Orange oil is by far the easiest thing I have ever used to remove stickers, price tags and labels from items. 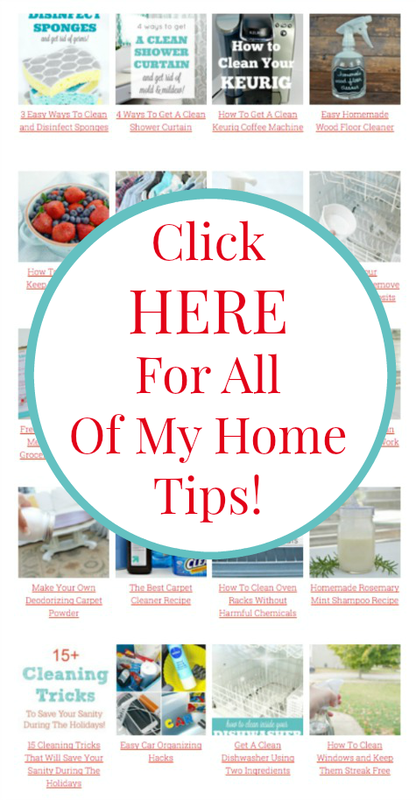 I keep a small bottle of it on my kitchen counter at all times, and it is a true game changer! 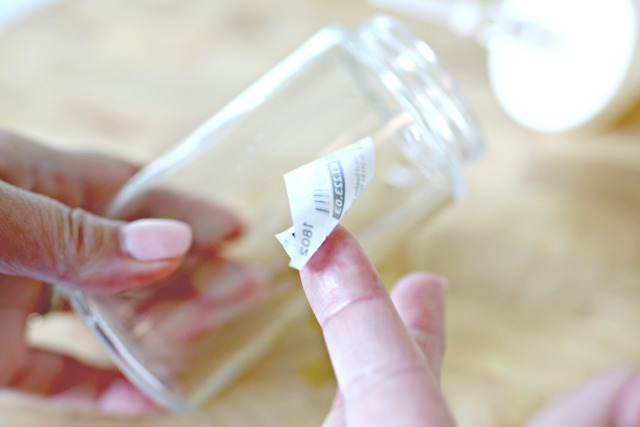 Not only does it remove stickers and tags, but it will remove anything sticky from your countertops as well. It’s my favorite “helper” in my kitchen! 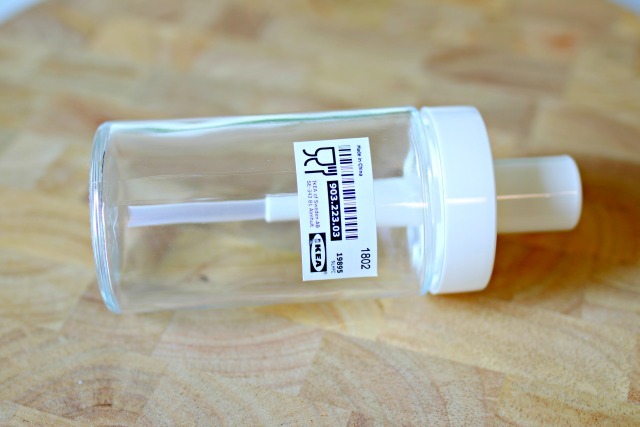 To show you just how easy it is to use, I created a quick video for you showing how it helped me remove the labels off of two cute IKEA soap dispensers that I recently bought…check it out below! Start by laying your item that has a sticker on it on a surface like a cutting board or towel. Next, cover the sticker with orange oil. 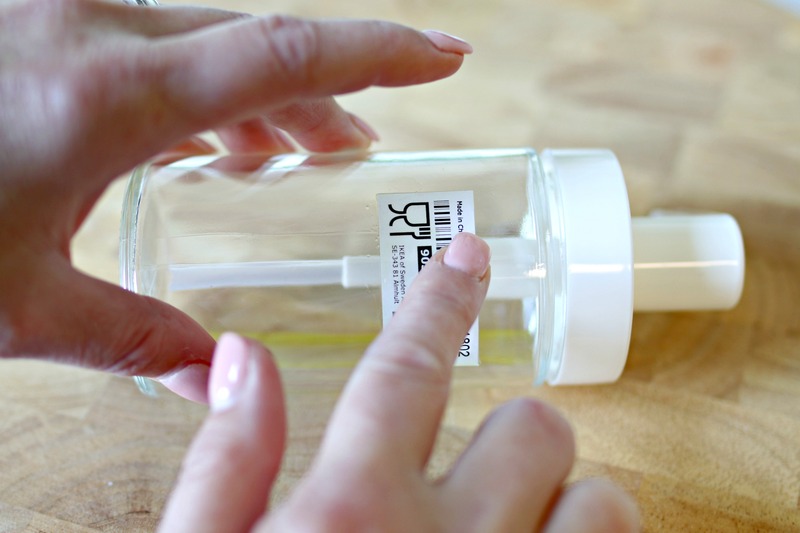 Now, use your finger to rub the orange oil all over the sticker. Start by pulling up one corner of the label, then slowly pull it off of your item. It should pull away with ease! If it seems to be stuck, add a little more orange oil, then try removing. 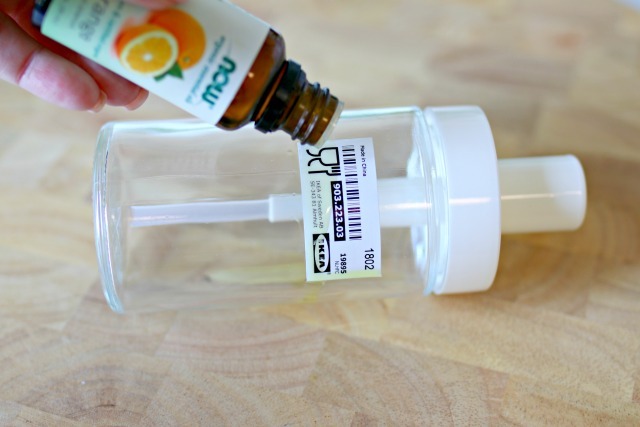 For really sticky tags and labels, the orange oil may need to soak in for a few seconds to work. 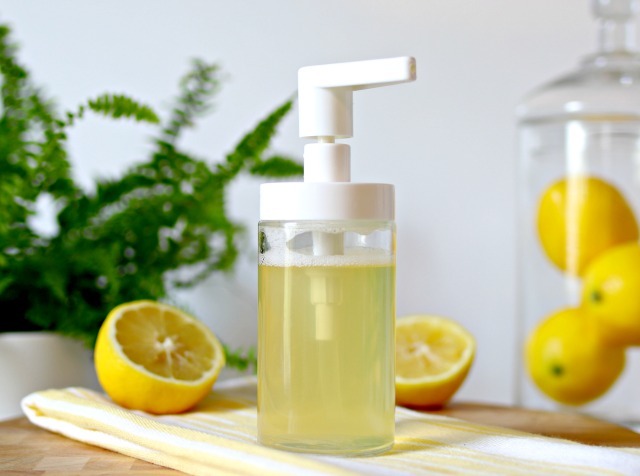 This easy 3 Ingredient Liquid Hand Soap can be made with so many different scents, and bonus…it’s non-toxic, so your kid’s can even make their own! 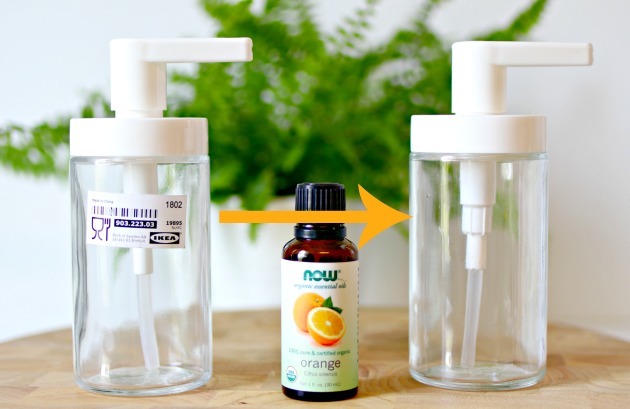 Looking for an easy, non-toxic cleaner? 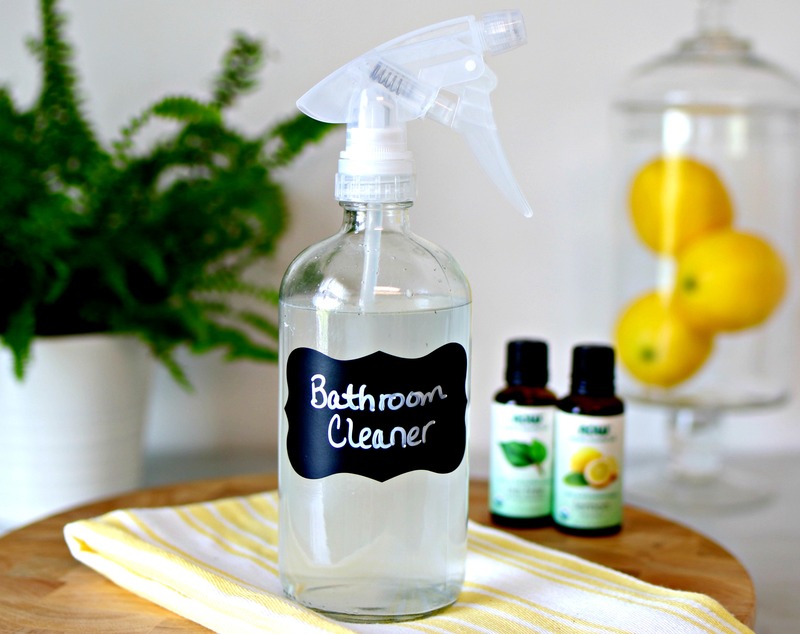 Check out my Homemade Bathroom Cleaner Disinfectant Spray!